Real beauty tips are buried in our culture, but we have to dig to find them. America the Beautiful is really Americans the Overweight and Exhausted unless you DON’T DO what everyone else is doing. If you stay up late to watch TV, watch a movie every weekend, eat fast food several times a week, work long hours at the office and spend your paychecks for the next 4 years at least then you’ll die like the average American- from heart disease, cancer or diabetes complications. If you want to be healthy and happy and live BEAUTIFUL, then you must do more of these “5 Ways to Live Beautiful” everyday. 2. Exercise. Adding to the long list of reasons to take the stairs, is the fact that exercise cleans skin pores and that give you a youthful, healthy glow. Without sweating, adult acne will be common as well as puffiness. Exercise in the morning decreases the stress hormone, cortisol, which leads to wrinkles. 3. Eat a protein-filled breakfast. Proteins break down to amino acids and those are the foundation of the collagen in your skin. Without a protein filled breakfast, its tough to have great skin and great energy throughout the day. 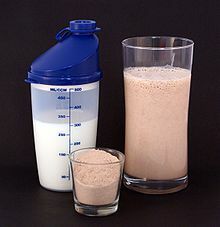 Try a protein shake, meat, beans and bananas. 4. Hydrate. Coffee does not count as water, nor does soda… so even if you do drink these beauty zapping liquids still… try to get 70-80 ounces of “liquid gold” or water into your body today! Even more beautifying is getting 50 ounces of water in you before noon! Bonus beauty tip! 5. Smile. If you don’t have anything to smile about today… GET SOMETHING to smile about QUICK! We must build rewards into our day that don’t include food, like taking a swim, calling a friend, taking a walk, reading a good magazine, being intimate with your spouse, looking at the beauty of nature and more. This is up to you to create. Beauty is more than skin deep- its LIFE deep. Living beautiful today includes doing things that make you happy and healthy.